Gardener or not, a visit to the Missouri Botanical Garden is a pleasant way to while away an afternoon. Today’s overcast skies were perfect for viewing all the vibrant blooms. 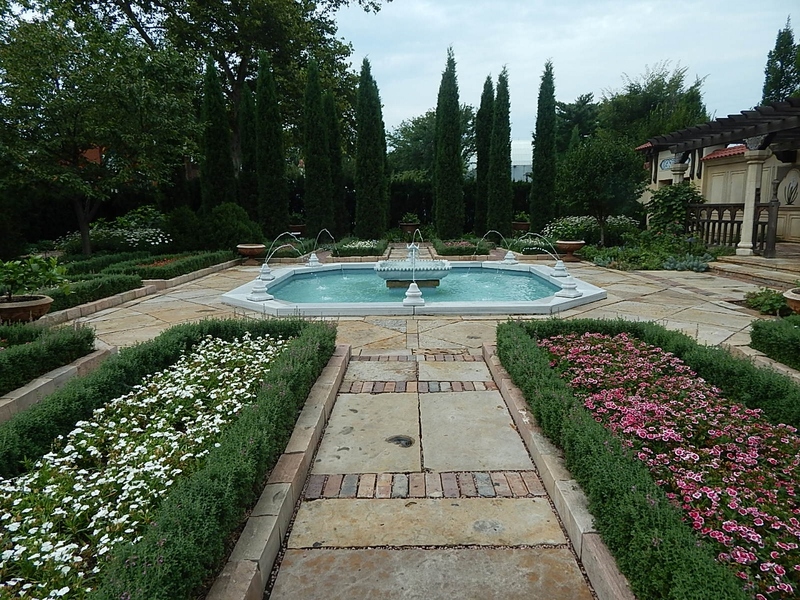 Right now my favorite area is the Kemper Home Gardening Center and its associated demonstration gardens. Here you can see all sorts of containers, butterfly gardens, kitchen gardens and the All American Selections demonstration. It’s a great place for inspiration and ideas. If there’s one theme I’d give the garden this summer it would be lush and high-contrast. 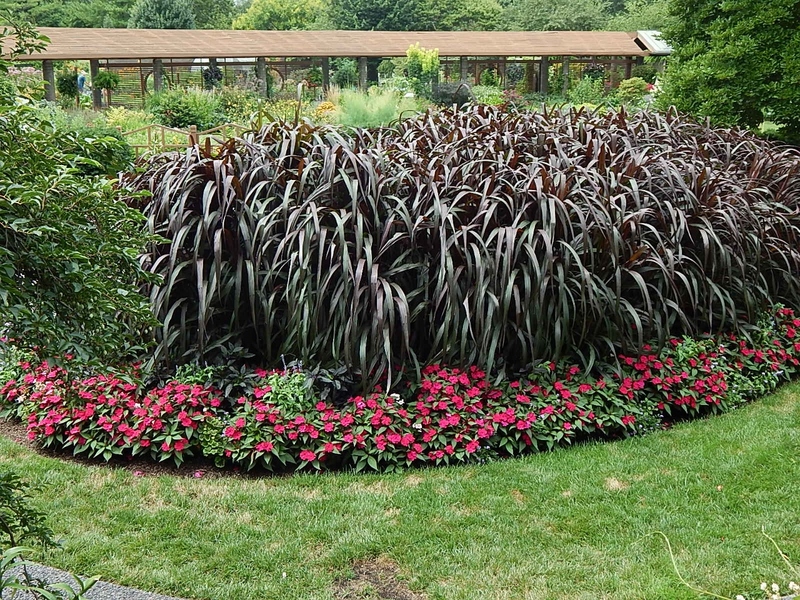 Plantings with hot shades of purple, green, yellow and orange that contrast with dark hues of black like the giant grass below are common. I don’t know the name of this tall purple grass paired with vinca but it’s spectacular. 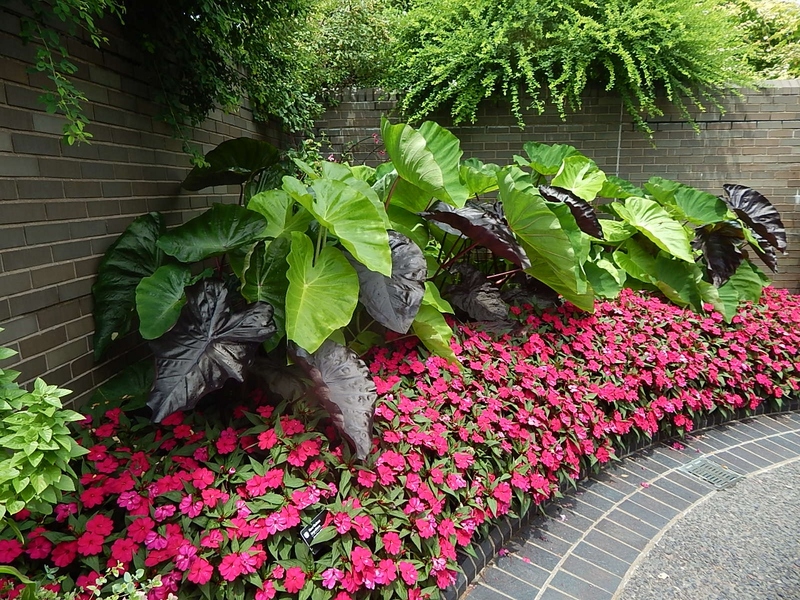 Green and black elephant ears surround a mass bed of lipstick pink vinca. As you can see, vinca grows quite well in our summer heat. So do the elephant ears. 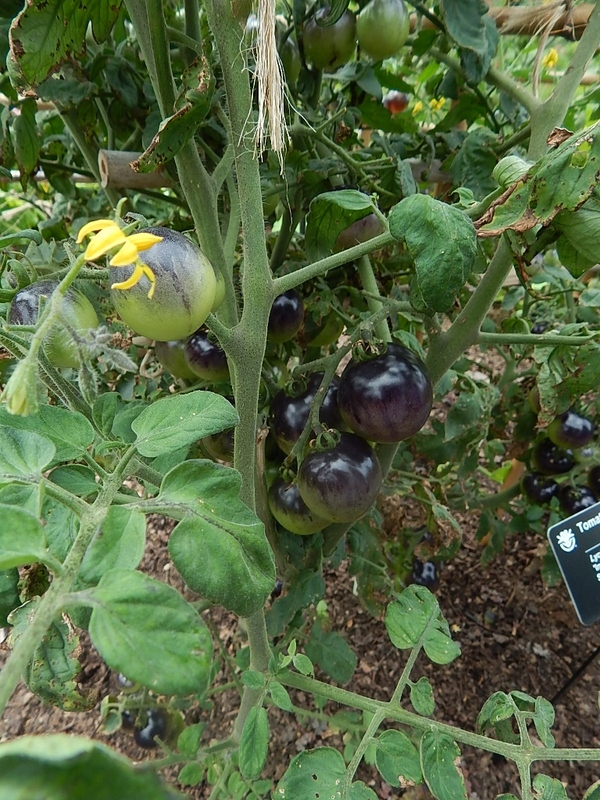 Keeping to the purple and black theme, how about these tomatoes? They’re called Indigo Rose tomatoes. 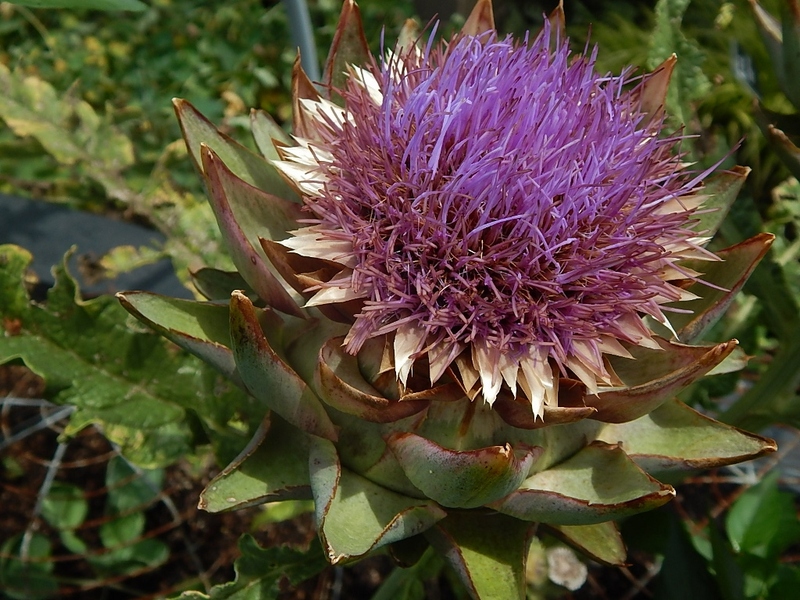 I’d never seen an artichoke growing until today. I’ve seen lots of posts on Pinterest for pallet gardens. This one is on steroids. Coleus is predominant in many groupings. 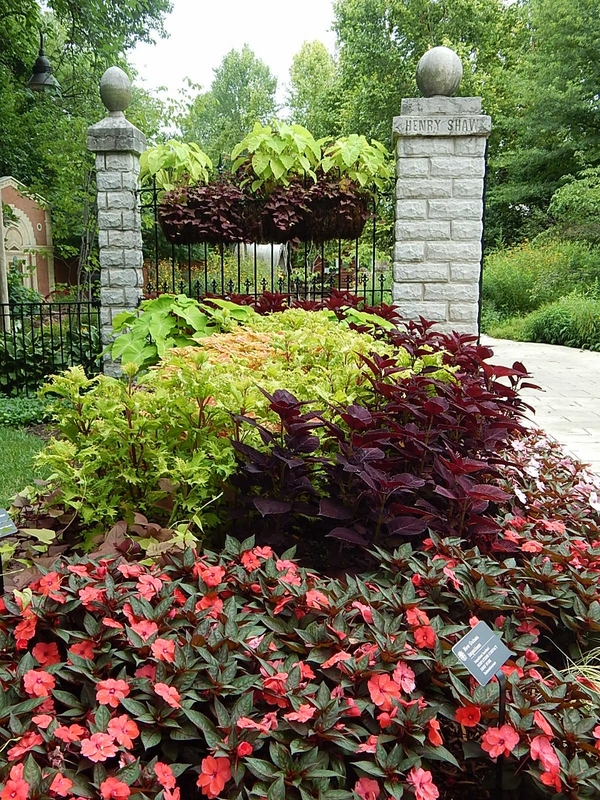 Here maroon coleus–accented with chartreuse coleus–rises above coral toned vinca. This is one side of the entrance to the children’s playground and you pass it on the Kemper Center. The large haybasket probably weighs a lot and such a structure would most likely pull down my fence. Here it has plenty of support. All is not pink, purple and black in the garden. The garden designers are far more versatile. 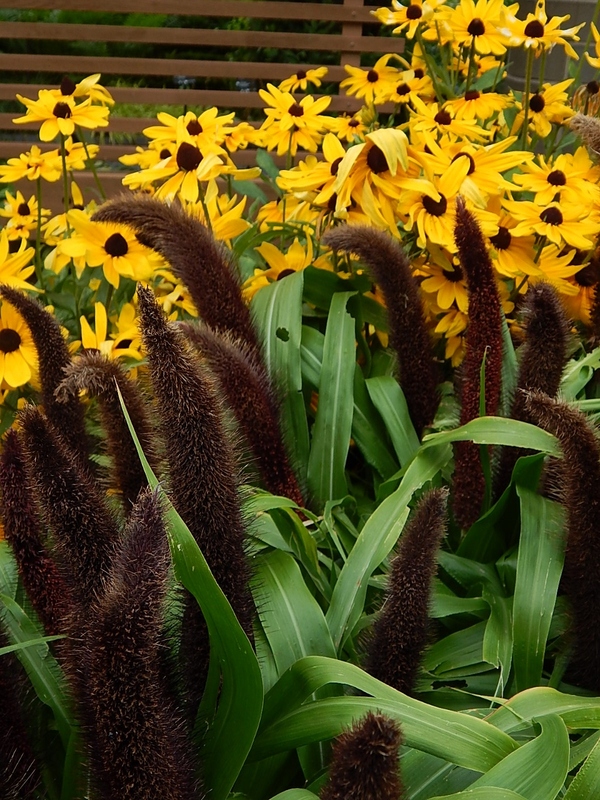 This collection of black eye Susans and ornamental millet is an interesting combination of form and texture. I like the cat-tail bloom on the millet. I’ve not seen this in a nursery here but would try it in a container next year. 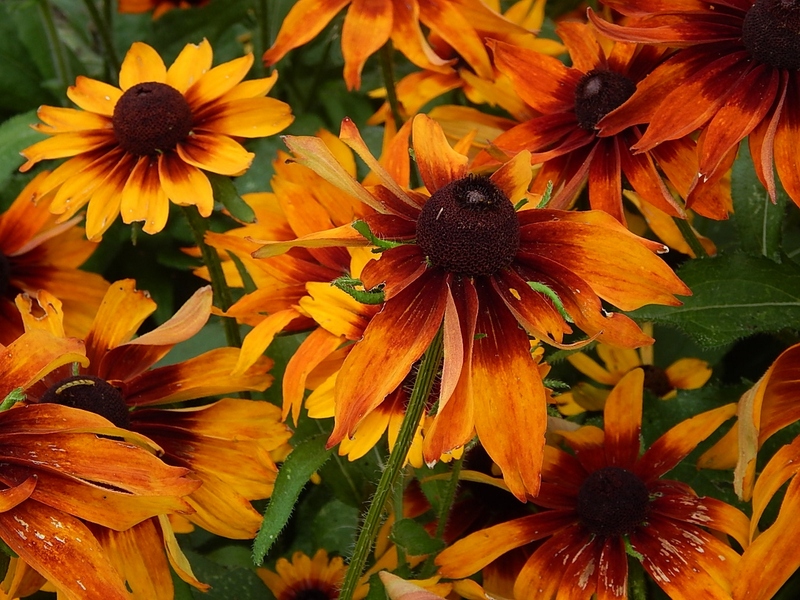 Of course, there are lots of black eyed Susan cultivars in the cutting garden. 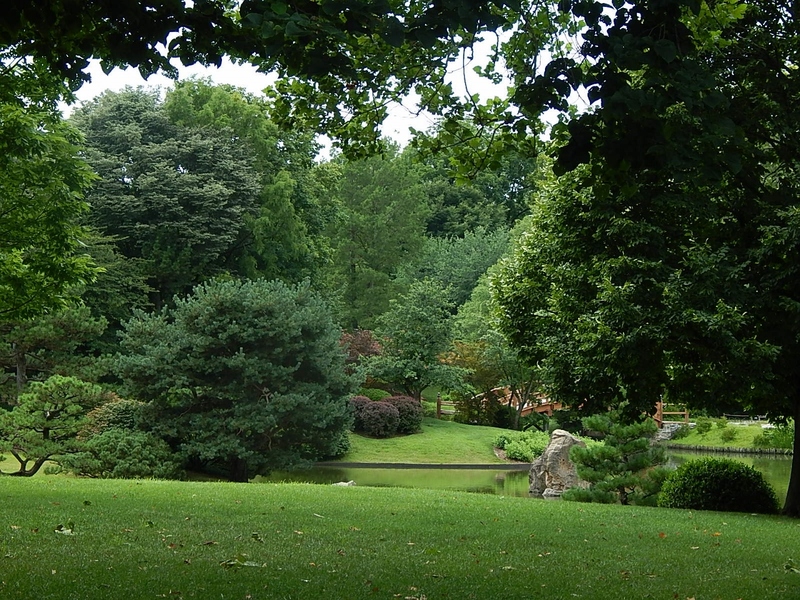 The Japanese garden with its tranquil lake and gently sloping hills lies beyond the demonstration gardens in the further reaches of the garden. It’s a nice place to sit and relax or feed the carp. In spring, blooming azaleas and dogwoods make this section of the garden a popular destination. 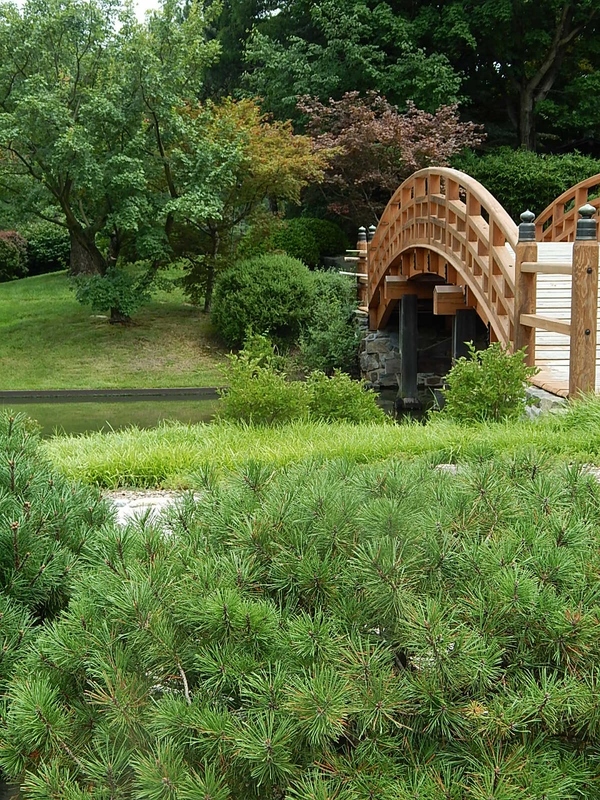 Here you can enjoy a large selection of pines, dogwoods, barberries and maples. Winding my way back to main entrance, and continuing on the tranquil vibe, I made a leisurely stop at the Bakewell Ottoman Garden, a small walled garden planted in the gardening tradition of the Ottomans. Istanbul, which was home to the Imperial capital of the Ottoman Empire, and St. Louis lie on the roughly the same latitude, which means we can grow a lot of the same plants. Apparently there are no surviving types of this style garden, which was developed between the 16th and 19th centuries. 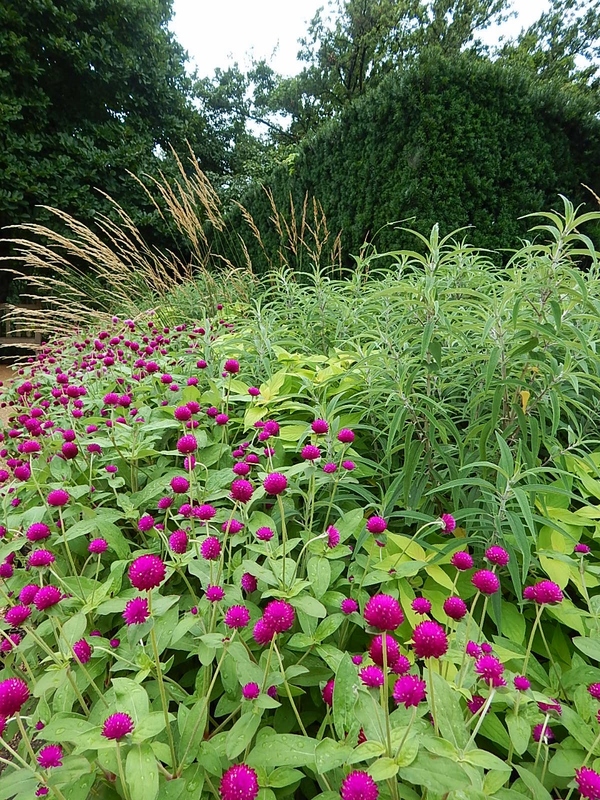 The plantings here are primarily naturalized or native to Turkey. 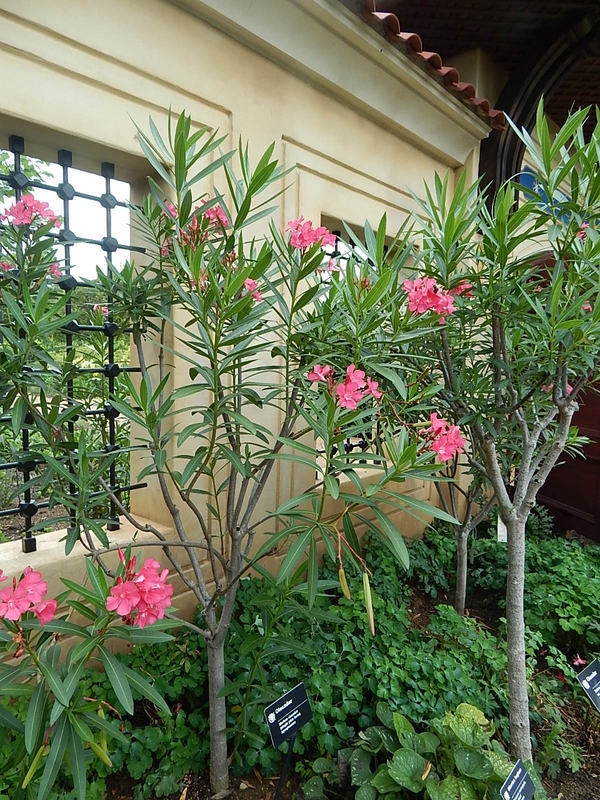 Hard fruits such as pomegranate and Meyer lemons are planted in pots throughout the garden. Currently, alternating pink and white beds of dianthus are bordered by germander but the garden is well known for its Turkish tulip and bulb display in the spring. Oleander and columbine line one wall of the garden. The fountain is inviting and looks refreshing on a hot summer day. 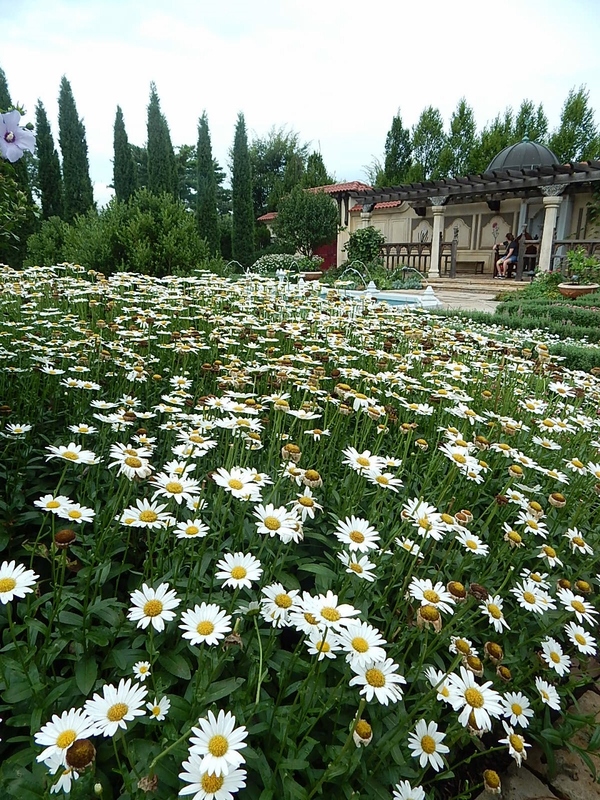 A mass of shasta daisies sway in the breeze. 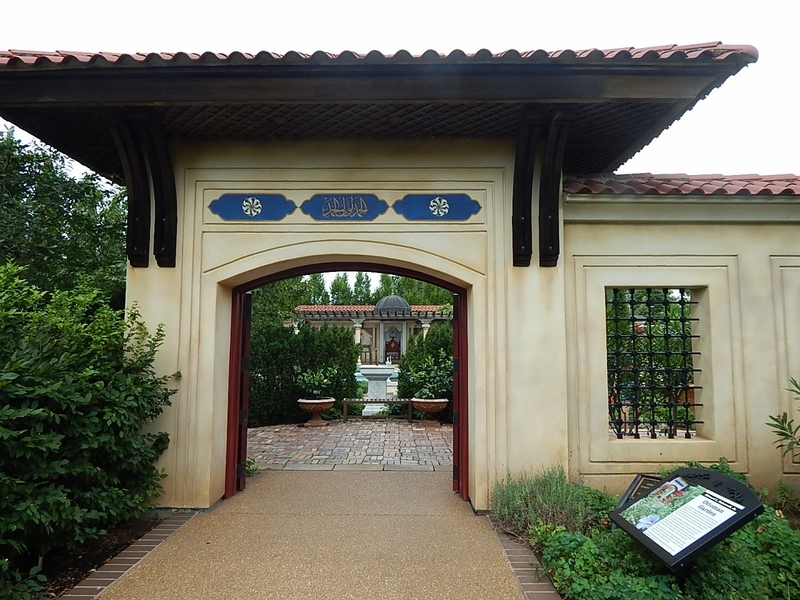 Categories: Musings | Tags: Missouri Botanical Garden, Missouri Botanical Gardens | Permalink. A common expression heard in St. Louis is, “If you don’t like the weather just wait a day.” So true. Last night’s ice and snow was a short-lived inconvenience as the temperatures got up into the 40s today and the sun melted what was sitting on the drive way. 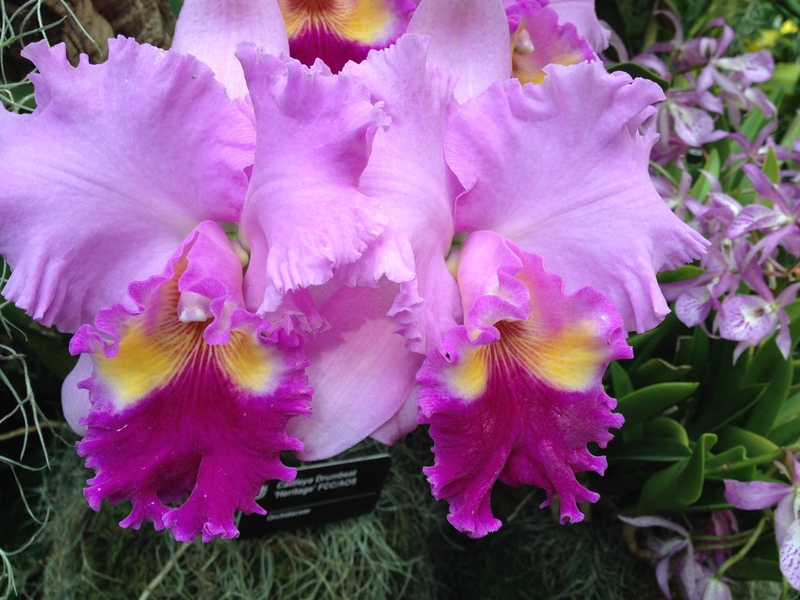 Good thing too, as I was not delayed in a visit to the Missouri Botanical Garden for its annual orchid show. 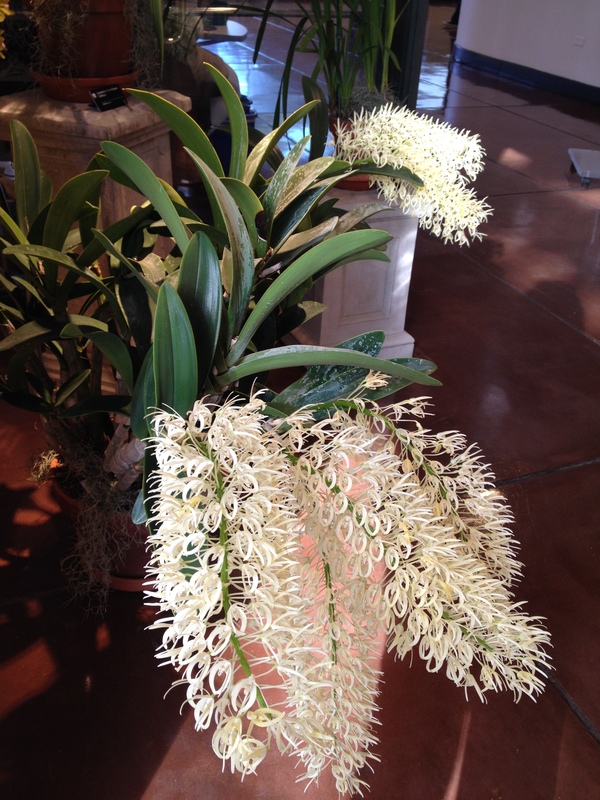 There may be variety in the Midwest weather–especially at this time of year–but nothing compares to the variety found in orchids. Wikipedia tells me that there are four times the number of orchid species than there are mammal species and twice the number of bird species. That’s a lot of orchidaceae. It makes the temperature swing we are expecting seem insignificant. 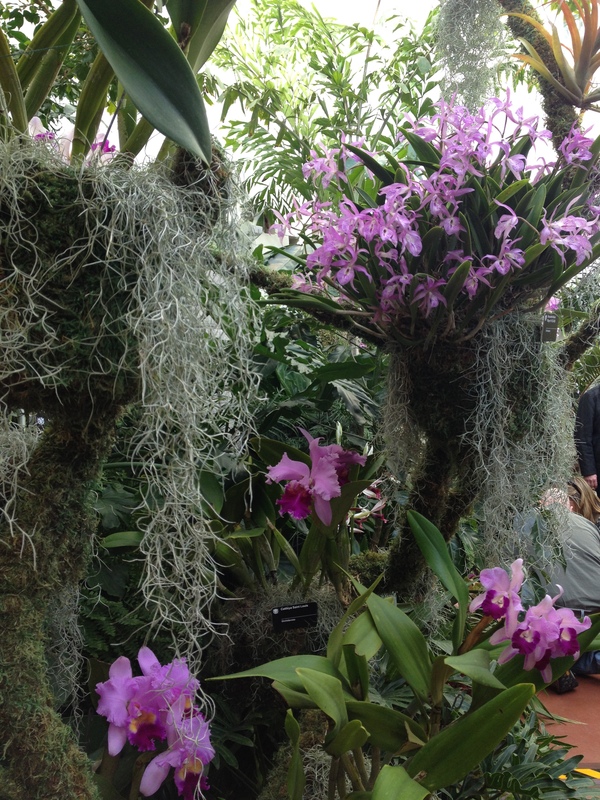 And fortunately for visitors to the orchid show, MoBot provides a healthy assortment to view. 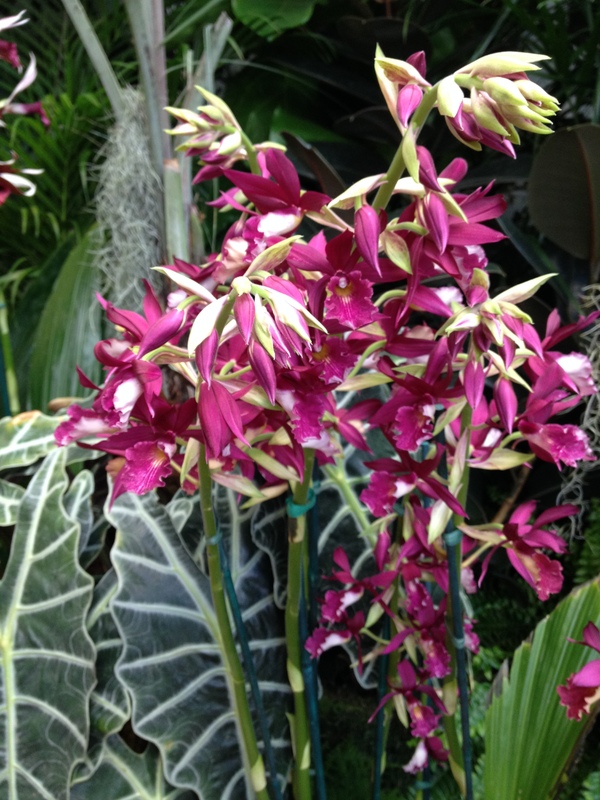 The show displays but a sampling of the garden’s permanent collection of more than 7,000 orchids. 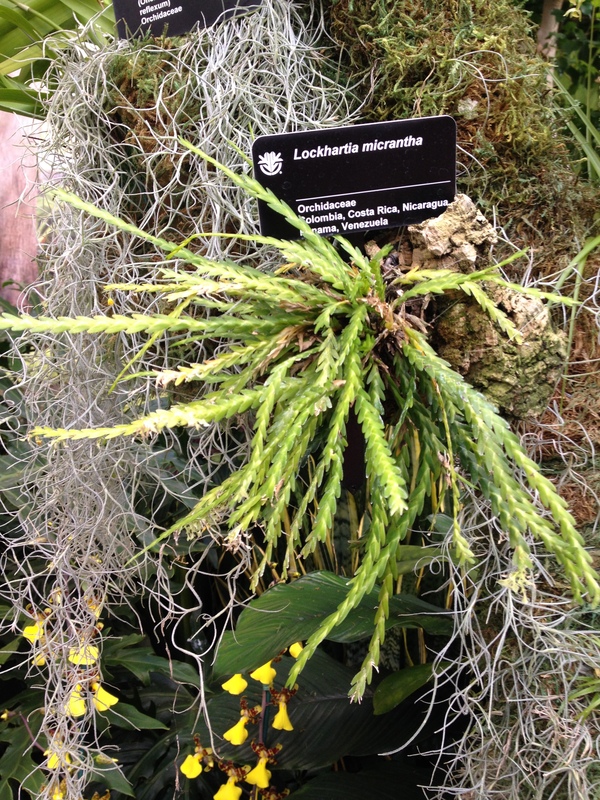 These represent more than 280 genera and 2,500 unique orchid taxa. The exhibit is in a moderately sized room and went under construction immediately after dismantling the Holiday show. 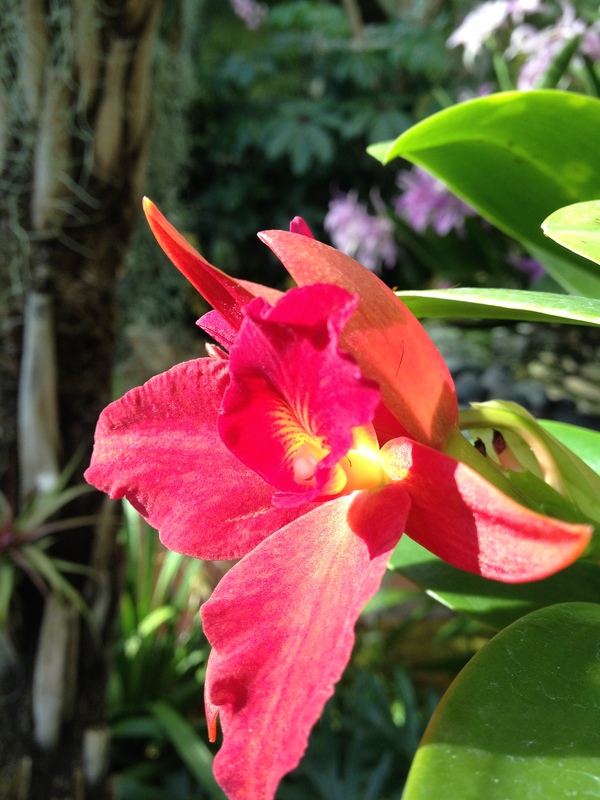 Apparently it takes quite a bit of time to prepare the space for the lush assortment of cattleya, phalaenopsis, oncidium and dendrobium species, to name drop just a few species. What I really enjoyed is the way the designers did a nice job of moving the color palette through the rainbow. There are yellows, oranges, reds, corals, purples, chocolates on display. 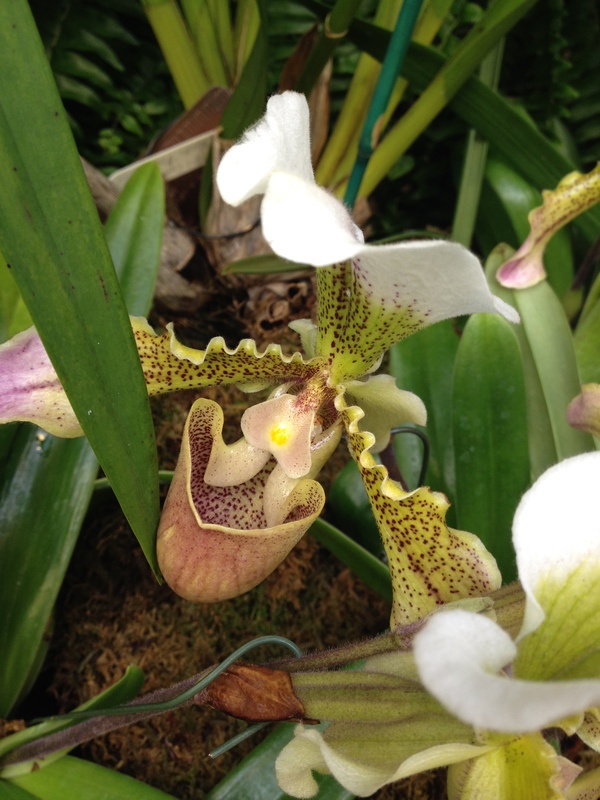 The theme of the show is “Orchids and Their Pollinators” and the Garden provides a G-rated lesson in the mating habits of orchids, pointing out that orchids have a very specific relationship with their pollinators. They lure them in ways to attract specific animals and insects. 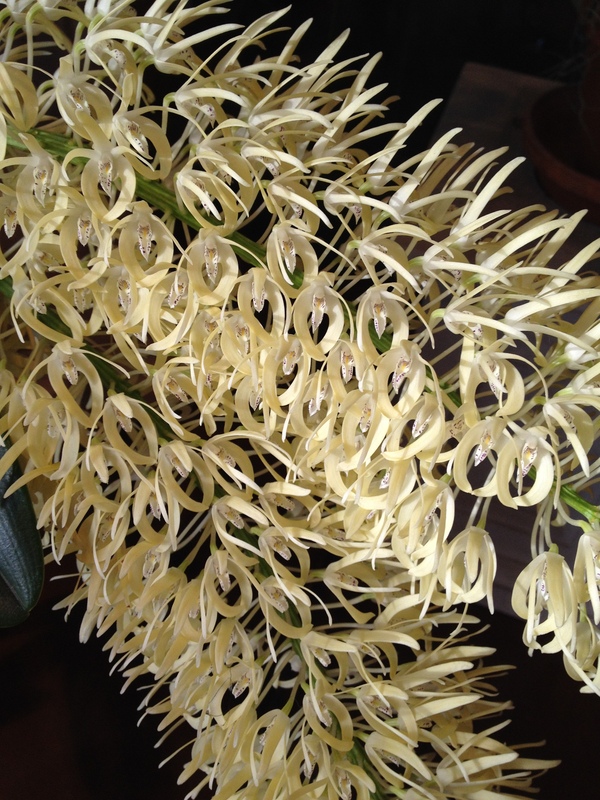 In fact, their floral structure is specifically adapted to accommodate a specific pollinator. 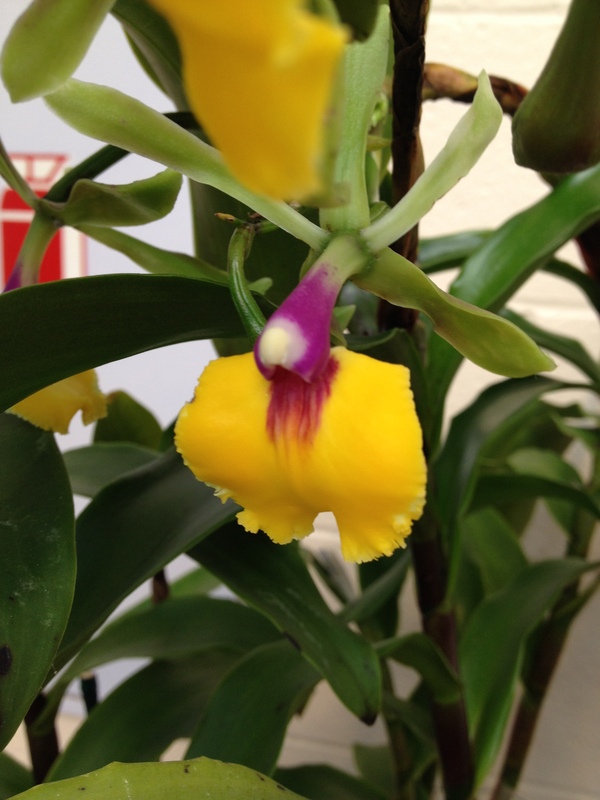 If that pollinator becomes extinct, so might that orchid species. To learn more about the importance of pollinators visit the Pollinator Partnership. What floral show is playing in your neighborhood? 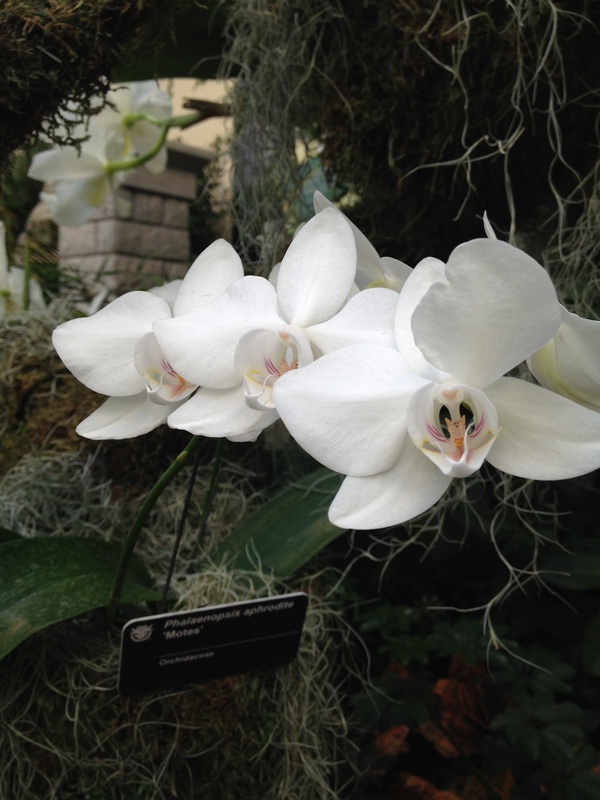 Categories: Beyond Arch City, Musings | Tags: Missouri Botanical Gardens, Orchids | Permalink. It turns out the backyard of my mid-century suburban St. Louis ranch home (you get the idea) was a blank slate. I had a project and a hobby in the making: gardening. Here are a couple of things I’ll share first. I am not (was not) a gardener, nor would I describe myself as a hobbyist. That’s not to say I didn’t like gardens. In fact, I love them. Always have. Nothing gives me more serenity or energy than a stroll through the nearby Missouri Botanical Garden. 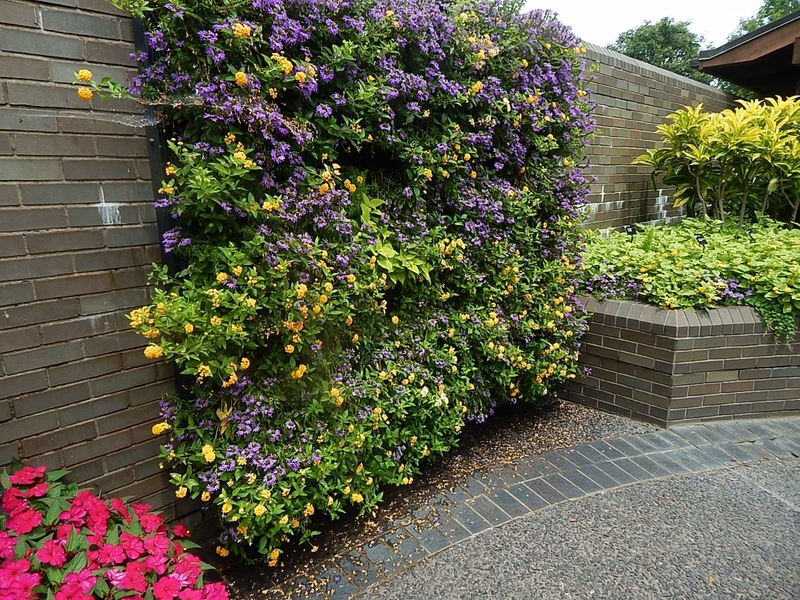 I love a good house and garden tour, and the St. Louis metro, with its zones 6a-6b climate, abounds with gorgeous yards and gardens brimming with a wide array of plant diversity. But suffice it to say I am a busy mother whose three beautiful kids who are in various stages of the launch phase, who works full time, and has not spent a lot of time getting dirt beneath her manicured nails. But that’s changing. I bought the ranch because I was downsizing, following the demise of a long-term marriage. This place is the place I call my own, and I knew that day I was sitting on the postage-stamp of a patio, considering buying this house, that the backyard was going to be my first project. My so-called “vision” ago wasn’t much more than to get rid of the wobbly, unevenly installed pavers and put something in their place. Something solid, something that had a better scale to the house and yard, something inviting, and something surrounded by a garden that I could also enjoy from the family room, which features walls of windows looking out on the yard, or from the kitchen. I also wanted to have less lawn to take care of and the hardscape and landscape would help with that. In late March 2011 I moved in and believe it or not the PJMs were nearly finished blooming! Remember, we are in St. Louis. I spent the first spring and summer mowing the grass between the pavers that were masquerading as a patio. I wedged my patio table and six chairs on this platform and moved them every time I mowed the yard. I’d post a picture but they were lost when my cell phone fell into the Meramec River on a kayaking trip. (Note to self: take the photos off the phone.) 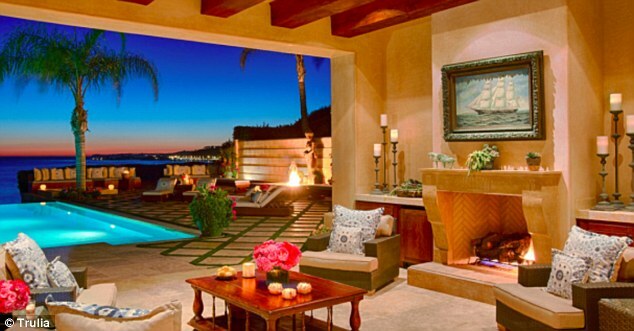 If you watch Real Housewives of Beverly Hills, think Yolanda Foster’s property minus the pool, minus the ocean view, minus the palm trees. Evenly laid square blocks with grass growing between them. My big box backyard pavers were kind of like that. Sort of. Okay not at all. Mine were actually uneven and the grass between them was weedy and in some spaces rather bare. After spending a summer moving the table and chairs, which took up the entire patio, I knew the postage stamp needed to go. I spent the summer researching, discussing my options and pricing the project. After much deliberation (patio or deck? 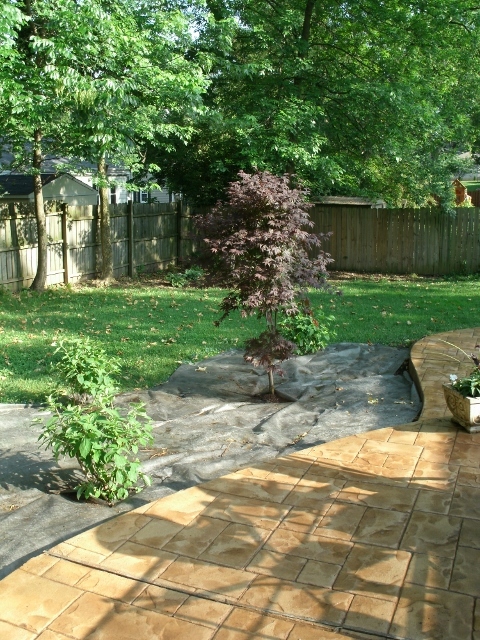 ), I had a stamped concrete patio installed in the fall. I wanted something permanent and relatively maintenance free that would fit more than the umbrella table and chairs. Good bye postage stamp. Building a garden bed that runs the length of the patio. And I wanted to surround it with garden beds. Categories: Musings | Tags: garden, Missouri Botanical Gardens, Real Housewives of Beverly Hills, St. Louis, Yolanda Foster | Permalink.